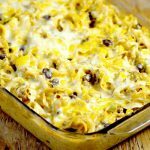 Enchilada Pasta Bake is a delicious way to use up leftover taco meat and great for family dinner. Noodles tossed with a creamy, cheesy, and slightly spicy sauce mixed with taco-seasoned ground beef, corn, and black beans. 1 pound taco meat seasoned ground beef. We use this homemade taco seasoning. In a large skillet, add cream cheese, sour cream, and 1/4 cup enchilada sauce. Stir until combined and smooth. Once mixture is smooth, add remaining enchilada sauce. Add ground beef, cumin, chili powder and green chiles, and stir to combine. Remove from heat. Stir in corn, black beans, 3/4 cups cheddar, and 3/4 cups Monterey Jack. Place sauce mixture and cooked noodles in a 9"x13" baking dish. Stir to incorporate. Bake uncovered at 350 for 15-20 minutes until heated through and cheese is melted and bubbly.